St. Francois Xavier is Manitoba's second oldest settlement and has quite a few plaques and cairns along Highway 26, the old red river cart route to the west. 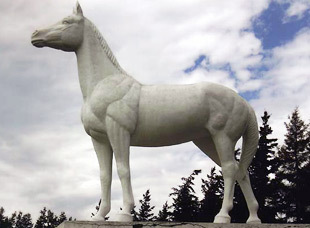 In addition, visit the statue of the White Horse when entering the village along Highway 26. Steeped in local folklore, the prominent horse is a strong symbol of the rich cultural history of the municipality. The Welcome Stop on the Trans-Canada Highway in St. Francois Xavier offers restaurant, gas station and convenience store services, as well as a KOA RV/campground with a splendid view of the Assiniboine River. Visitors to the berry farms Assiniboine Trail Berry Farm, Nott’s Berry Farm and organic vegetables & U-pick at Blue Lagoon Florascape are provided with a full day of sightseeing and delicious, locally grown berries and vegetables. The St. Francois Xavier Airport, located just west of the village, has a landing strip for small aircraft.